Do you want to train for a great new career in electrical safety? Easytest offers quality online Test and Tag Courses to qualify with a nationally recognized Test and Tag certificate . Why go to Tafe when you can do easytest’s online test and tag training when it suits you – and at only $360 per person, which is a lower cost than most other traditional providers will charge you. With our online course you can avoid the hassle of organizing daytime classes, travel, and accommodation. Instead, you can just access easytest online resources when you need them. And as our course is online, we don’t have normal overhead costs – which means we can offer you the best priced course on the market. If you are planning to retrain as a Test and Tag technician, our comprehensive online course is the way to go. 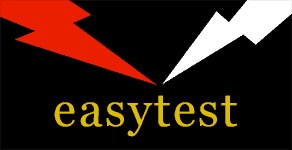 Using easytest you can work at your own pace, and you won’t need to take time off work – hence losing income. Electrical technicians command excellent hourly rates, and there is strong employment growth. As Australians increasingly import electrical goods from other countries, it’s essential that everything is thoroughly tested before being declared compliant with Australian safety standards. What does a Test and Tag technician do? By law, all workplaces are regularly required to carry out electrical testing of all portable appliances and safety switches. Once tested, a ‘tag’ citing the test result is attached to the relevant item – so that everyone is aware that the device is safe to use. Of course any problems found from the testing should be actioned. Electrical safety test records are also created and managed using Microsoft Excel so that information can be comprehensively covered, for later access when needed. And there’s no need to worry, it’s all very user friendly! Our highly trained instructors will ensure that you are work ready upon successful completion of the easytest course. You don’t need specialized electrical or technical knowledge to become a test and tag technician. Our short online training courses here at easytest will teach competence. Our lessons are designed for consistency, so you’ll get the best presentation possible. To make it easier for our students, lessons are divided into 10 minute sections, short enough for anyone who is time poor. Because it’s an online experience, you won’t experience the disadvantage of potentially ‘sitting at the back of the class’. Using easytest you’ll be able to learn at your own pace. Revision is easy, as students can go over material as many times as they need to – until they feel confident they know their stuff. The easytest online Test and Tag training course is the original and so far, the only fully online Nationally Recognised course of its type. Lessons are available for review after the completion of the course. And unlike a classroom experience, easytest trainers are always available after the completion of the course. Our highly trained instructors will ensure that you are work- ready upon successful completion of the easytest course. Our courses are nationally accredited under the auspices of T.I.M.E. Pty Ltd. If you enroll two or more students, you’ll receive a 10% discount from our already affordable fee.